Northern Pacific Railway 5410A, Stacy Street Yard, Seattle Washington, January 6, 1962. Home for Christmas during my first year at Washington State University. My train-chasing buddy – El Purington – and I are making the rounds – Union Pacific, Milwaukee Road, Great Northern and the Northern Pacific at Stacy Street. The yard was named for a street that dead ended into the yard, honoring Martin Van Buren Stacy - one of Seattle’s early movers and shakers, who built the so-called Stacy Mansion, in 1885, seen here with a restraunt added. Northern Pacific’s Stacy Street Yard was renamed "Seattle International Gateway" in August, 1985. 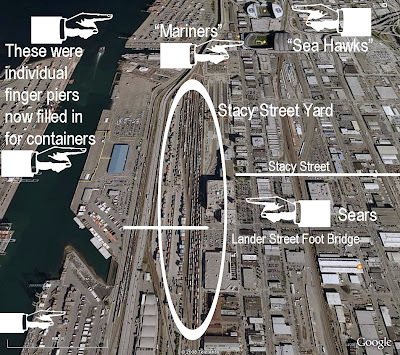 A prominent feature of the Stacy Street Yard was the Lander Street pedestrian footbridge which spanned the yard from the south end of Sears-Roebuck, over to Alaska Way and the Lander Street pier. That structure was really nifty because you could look down on rail operations. It was torn down in 2001. 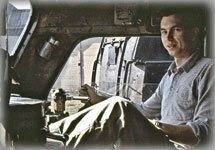 Those were the “Golden Years” of railroading in and around Seattle that was destroyed with a stroke of the pen when the Great Merger took place. We had a great diversity to watch and photograph. And in Elwin’s case, make audio recordings! Railroad Stuff: Northern Pacific Railway 5410A, built by Electro Motive Division as an FT-A, 1,350 horsepower, in 1945, serial number 2839. 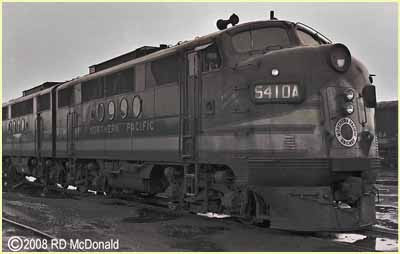 Retired by Burlington Northern in 1964, traded to General Electric for a U25C. Thanks for the history and background Robert. I always enjoy it. Positive Train Control - Again! Bricks & Mortar: Consumer Alert!